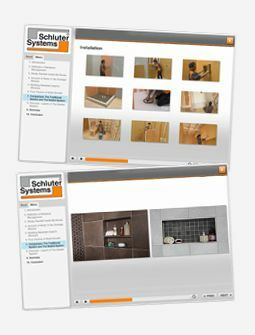 All Schluter-Systems’ thin-set mortars, including the ALL-SET and FAST-SET modified varieties can be used to set tile over Schluter®-DITRA, DITRA-HEAT, KERDI, and KERDI-BOARD products. Made right here in North America, Schluter thin-set mortars are formulated to ensure that you, the installer, get consistent and steadfast results with respect to sag-resistance, texture, and workability. Whether you’re setting tile or Schluter membranes and boards, the proper mixing technique is essential to ensuring perfect consistency, outstanding workability and optimal performance. Read up on our Warranty!